LAS DIFICULTADES CON LA QUE SE ENFRENTAN TODOS LOS ESTUDIANTES DE ANATOMÍA SON LA GRAN CARGA DE CONTENIDOS QUE DEBEN APRENDER Y LA POCA POSIBILIDAD DE INTEGRAR ESTE CONOCIMIENTO CON LOS ASPECTOS CLÍNICOS; ESTO HA MOTIVADO A LOS AUTORES A ELABORAR UNA OBRA QUE CONTENGA Y RELACIONE LAS DOS ÁREAS: LA ANATÓMICA Y LA CLÍNICA. LA CUARTA EDICIÓN DE ANATOMÍA HUMANA EN CASOS CLÍNICOS PRESENTA UN DISEÑO NOVEDOSO Y ATRACTIVO QUE LLEVA AL LECTOR DESDE LA SIMPLE MEMORIZACIÓN, HASTA LA APLICACIÓN DE LOS CONOCIMIENTOS EN LA PRÁCTICA CLÍNICA. ENTRE SUS CARACTERÍSTICAS SE DESTACAN: UNA CUIDADOSA SELECCIÓN DE CASOS CLÍNICOS REPRESENTATIVOS DE CADA ÁREA ANATÓMICA. NUEVAS FIGURAS CON SEÑALIZACIÓN DE LAS ESTRUCTURAS ANATÓMICAS. CAPÍTULOS DEDICADOS A LA ANATOMÍA DE SUPER¬FICIE Y SU APLICACIÓN EN LA EXPLORACIÓN FÍSICA. UN SITIO WEB COMPLEMENTARIO QUE INCLUYE UNA INNOVADORA HERRAMIENTA CON AUDIOS EXPLICATIVOS DE LA RELACIÓN DE LA ANATOMÍA CON LA CLÍNICA. ASIMISMO, EL ESTUDIANTE TENDRÁ LA POSIBILIDAD DE CONOCER LAS RESPUESTAS A LOS EJERCICIOS DE LOS CASOS CLÍNICOS Y DESCARGARLAS. 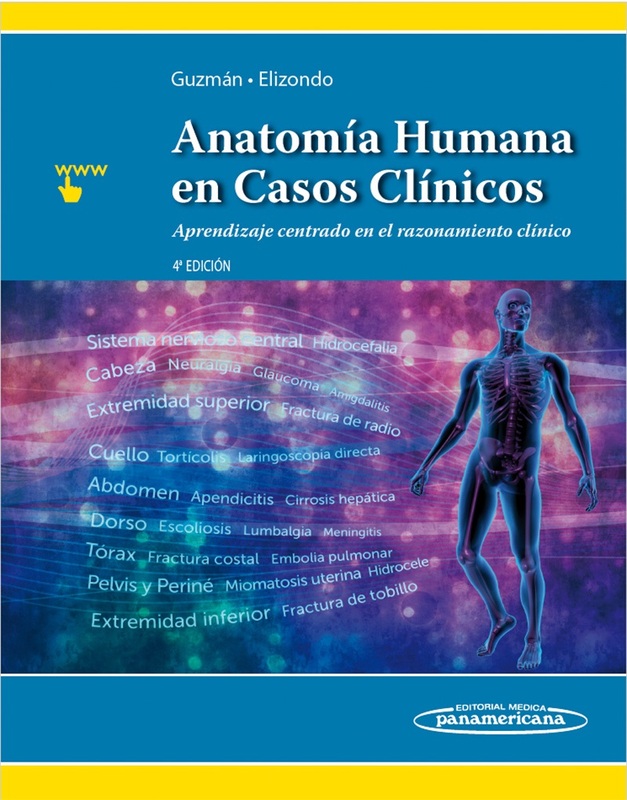 SIN DUDA, UN LIBRO IMPRESCINDIBLE PARA TODO ESTUDIANTE DE CIENCIAS DE LA SALUD EN FORMACIÓN, YA QUE DESARROLLA LAS COMPETENCIAS NECESARIAS PARA ELABORAR UN DIAGNÓSTICO MORFOLÓGICO INTEGRANDO, DE MANERA ARMÓNICA, EL APRENDIZAJE DE LA ANATOMÍA CON EL DE LAS ÁREAS CLÍNICAS.